(Last Updated : 02.11.18). Download Answer Key of DSSSB PGT TIER-1 Exam 2018 held in August 2018 at various exam centres in Delhi for various posts of PGT against Advt. No. 4/2017. This exam was objective in nature and there were total 200 questions (Multiple Choice Questions) which carry 200 marks (one mark for each question). Check here DSSSB PGT Answer Key 2018 for PGT Online Computer Based Exam August 2018. Candidates who have participated in PGT TIER-1 Exam 2018 are eager for Answer Keys of PGT TIER-1 exam held in July & August 2018 of the subject they are related to. Official Answer Keys of PGT TIER-1 exam was published by DSSSB on 08.09.2018 for the exam held on 08 August 2018. Discrepancies relating to these Answer Keys, if any, can be brought to the Notice of the Board up to 11.09.2018. Earlier, we had tried to prepare tentative Answer Keys of DSSSB TIER-I (PGT) Exam 2014 held on 30 November 2014 for various post codes. You can view/download answer key of the subject or post code, you have opted for the exam at the below link. 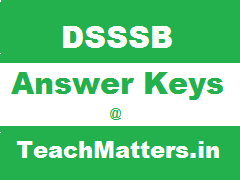 Please visit this page on regular interval to get updates on DSSSB Answer Keys for PGT TIER-1 Exam held on 30.11.14. Download here latest DSSSB PGT Question Papers 2018 as subject-wise and exam-wise.